Bold, Colorful, Captivating Glass Beads & Glass Beaded Jewelry designed for unique individuals with sophisticated tastes. Welcome to 3Graces Jewelry featuring hand-made glass beads created by me- Shana Roxanne McGovern in my glass studio in Columbus, Ohio. "I have been a bead lover my entire life and began collecting them long before I started making my own glass. Many of the jewelry pieces I design incorporate several different bead weaving techniques combined with the glass artistry created in the torch and kiln. By blending these techniques, each glass piece is enhanced and takes on its own unique personality. Beads use to complete each piece of jewelry include, Swarovski Austrian crystal (new and rare), Japanese glass seed beads (new and vintage), semi-precious gemstones, vintage glass, sterling sliver and vermeil. 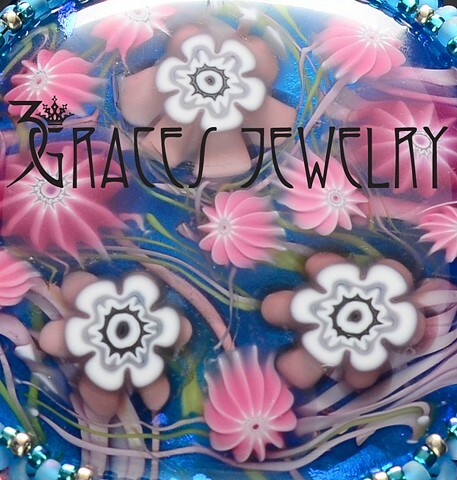 This combination of glass artistry, blended beading techniques and truly unique beading supplies birthed my own business, 3Graces Jewelry. Becoming a successful glass artist, glass art therapist, and teacher is a dream realized."